Microchip Technology Inc., a leading provider of microcontroller, mixed-signal, analog and Flash-IP solutions, has announced an expansion of the development platform for its growing portfolio of innovative 8-bit PIC® microcontrollers (MCUs) with Core-Independent Peripherals (CIPs). Designers can combine these building blocks to perform application functions autonomously, and they can be interconnected with an increasing amount of integrated Intelligent Analog peripherals. Because these functions are deterministically and reliably performed in hardware instead of software, CIPs enable system performance that is far beyond traditional MCUs. 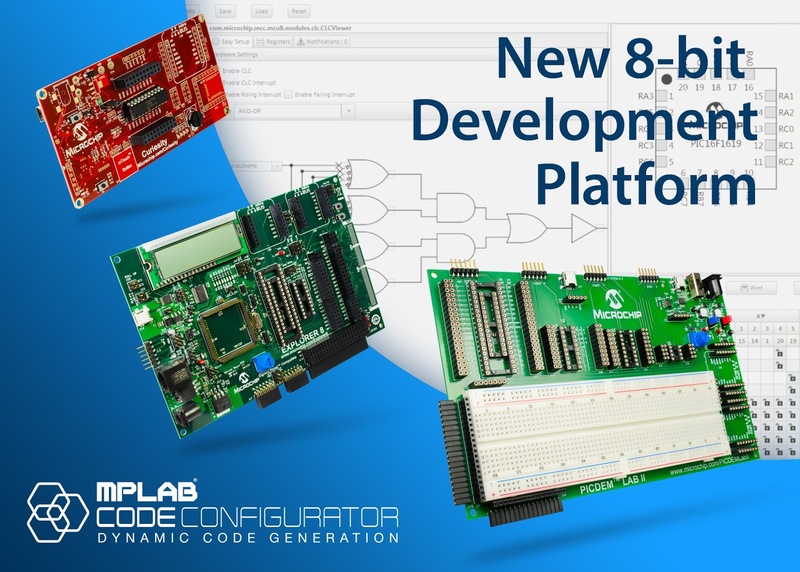 In order to further reduce development time with these next-generation MCUs, Microchip is releasing Version 3.0 of the MPLAB® Code Configurator (MCC)--the most recent version of Microchip's free graphical programming environment--and adding three new development boards. The Curiosity Development Board is an entry-level, cost-effective tool that includes an integrated programmer and debugger along with options for easy external connectivity. 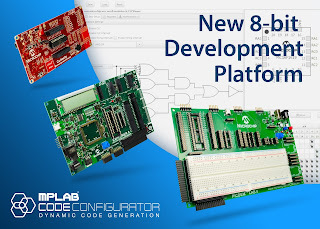 The Explorer 8 Development Kit is a rapid proof-of-concept tool with extensive integration, and it supports the widest variety of 8-bit PIC MCUs. The PICDEM™ Lab II Development Board is a comprehensive development and experimentation tool, with an analog and mixed-signal focus. This development platform, when combined with the Core-Independent Peripherals, can significantly reduce total design time. "For the last 20 years, most 8-bit MCU vendors have continued to release new products with essentially the same product feature approach," said Steve Drehobl, vice president of Microchip's MCU8 Division. "Add memory, expand pin count, increase the clock speed, and add more of the same peripherals. But embedded system design has changed, and now even the smallest applications have increased in complexity. We evolved the peripherals on our 8-bit PIC MCUs to be more deterministic and autonomous, so our customers can react quickly to changing market conditions with minimal code rewrites and very short validation cycles." All four of these tools are designed to fit within Microchip's longstanding and free MPLAB® X Integrated Development Environment, and can be easily augmented via Microchip's rich ecosystem, including development partners such as MikroElektronika and Digilent. This platform enables designers to rapidly and intuitively bridge the evolved 8-bit PIC MCU peripheral architecture with their application software, making it even easier to build functions and applications. MPLAB Code Configurator minimizes start-up time by reducing burdensome datasheet research and code implementation, while the hardware CIPs eliminate the verification of functionality in complex control systems. Version 3.0 allows engineers to configure both individual peripherals and high-level system functions that combine several CIPs, in just a few mouse clicks. MCC 3.0 also adds support for Microchip's libraries, such as TCP/IP, custom LIN drivers, and serial bootloaders, with future expansion plans for mTouch® capacitive sensing, USB, and RF protocols. Additionally, Microchip plans to release a Software Development Kit that will allow designers to add their own "often-used" 8- and 16-bit code snippets and/or libraries into MCC 3.0, for easy integration and configuration. Curiosity is a cost-effective, fully integrated 8-bit development platform targeted at first-time users, makers and anyone seeking a feature-rich rapid prototyping board. It supports 8-bit PIC MCUs in 8-, 14- or 20-pin PDIP packages, and the board's layout and external connections offer full access to each MCU's Core-Independent Peripherals. External connectors include a mikroBUS™ header that supports more than 100 of MikroElektronika's Click add-on boards, as well as a PCB footprint that enables users to easily add Microchip's RN4020 Bluetooth® LE module for communication. PICDEM Lab II is a development and teaching tool that gives users a large prototyping breadboard that enables them to easily experiment with different values and configurations of external analog signal conditioning and drive components for system optimization. This flexibility eliminates the hassle and expense of building a custom PCB in the early stages of a project. The board is also modular, allowing users to design a system with one or several PIC MCUs, simultaneously. Off-chip connections can be made in any manner the user sees fit, and the off-board expansion possibilities include several industry-standard interfaces in addition to a system of configurable connectors. Connections include two MikroElektronika Click board sockets, a 16-pin LCD module connector, and a 20-pin custom header for custom add-on boards. Microchip provides several labs to assist users in getting started quickly, ranging from simple MCU configuration to power conversion and Class D audio. Explorer 8 enables a broad range of 8-bit MCU functions, including human-interface, power-conversion, Internet-of-Things, battery-charging and many other applications. It also has the greatest capacity for expansion in Microchip's 8-bit board lineup, with two Digilent Pmod™ interfaces, two MikroElektronika Click board sockets, and two expansion headers for custom add-on boards that designers can create as their development needs change. Explorer 8 also supports Microchip's standard PICkit™ 3, MPLAB ICD 3, and MPLAB REAL ICE™ programmer/debuggers. The free MPLAB Code Configurator Version 3.0 is available now as a Beta download. The Curiosity Development Board (part # DM164137) is available now for $20. The Explorer 8 Development Kit (part # DM160228) is available now for $75. The PICDEM Lab II Development Board (part # DM163046) is available now for $100. For additional information, contact any Microchip sales representative or authorized worldwide distributor, or visit Microchip's Web site at http://www.microchip.com/CIP-090915a. To purchase products mentioned in this press release, go to microchipDIRECT or contact one of Microchip's authorized distribution partners. 0 comments on "Microchip Continues Driving 8-bit MCU Evolution With Innovative New Development Platform"